Cinemablographer: 'Noah': Faith in Chaos? There’s an old ruse in the adaptation crowd (mostly among the cranky folks in the English department who know diddly about film) that deviating from a book while transforming it into a film begets an act of heresy. Infidelity quips arise with folks decrying, “That’s not how it is in the book!” and some movies are shorted in the discussion. What happens, however, when said changes arise when adapting, well, The Good Book? Is it heresy of Biblical proportions when an author rewrites a sacred text, or is there something greater at play when one diverges from the source of all sources? Noah, directed by Black Swan’s Darren Aronofsky, probably isn’t a film where one can fault the source material, for whatever one’s beliefs are and regardless of whether one assumes the Bible to be a kind of truth or (probably) fiction, there aren’t any Lord of the Rings-y CGI rock-monster-angel-things helping Noah along the way. (Last time I checked, anyways.) Aronofsky, who notably does not include a black swan on Noah’s Ark (tsk, tsk), imagines the story in a way that makes it more relevant to contemporary audiences. Aronofsky's debut film Pi advertises itself with the line 'Faith in Chaos,' but the slogan might be more apt for the disorderly scope and fascinating vision of this Biblically-minded arthouse epic. Noah takes not a classical approach to the Bible, but rather an agnostic adaptation that values questions. This inspired, if messy, Noah is an epically ambitious production, not only for its visuals, but primarily for its creative license with the Book of Genesis. Noah features a mean tyrannical Noah of the Timothy Findley variety. If Mottyl the cat was not wanted on the voyage in the Can Lit revision of the story of the flood, then Noah of this Biblical epic has no room for women and children—how Hollywood of him! Russell Crowe plays Noah as a pious yet temperamental figure. Whereas the Noah of the Bible capably keeps things afloat, Crowe’s Noah is a Kane-like man whose power and authority alienates him from his wife and family. Noah’s salvation of the Earth’s birds and beasts plays out like an act of manslaughter as Crowe shows the man grow hardened and cold as he lets his fellow men die. Aronofsky puts Noah’s heroism in question when the waters rise and the soundtrack engulfs the voyagers on the Ark with the unexpected cries of drowning people. This definitely isn’t the tidy Bible story: people die when they could be saved, and Noah’s choice isn’t something that the waters of the new world can wash away. Equally notable is the film’s take on Noah’s wife. She doesn’t even get a name in the Book, but the film calls her Naameh and gives her a hearty role for Jennifer Connelly. Connelly, much as she did watching Crowe slip away in A Beautiful Mind, gives a heartfelt performance as Naameh struggles to balance her support for Noah and her devotion to her children. The psychology of her character alone suggests that there’s more at play in Noah than meets the eye. Noah and Naameh’s children are also intriguing departures from the story, for only one son, Shem (Douglas Booth), brings a wife, Ila (Emma Watson), into the Ark. Ham (Logan Lerman) and Japeth (Leo McHugh Carroll) board the Ark single and wifeless, although Ham does his best to find a mate in spite of Noah. Even the marriage between Shem and Ila pulls Noah away from the heavens and closer to Earth, for Ila and Shem conceive a baby during a passionate quickie before the Ark leaves the port, and Ila’s pregnancy marks the voyage as being considerable shorter than the 600 years of its Bible journey. The year of the flood is barely nine months long. The temporality of Noah, much like the anti-heroic title character and his three-dimensional wife, make for a most engaging reading of Genesis. Noah is a distant relative from the Biblical epics of the Charlton Heston days. Aronofsky instead gives it a contemporary spin by darkly re-imagining the story and interpreting the sparseness of the verse rather shrewdly. There’s nary a literal reading in Noah. Rather, Aronofsky’s interpretation looks between the skin and bones of the story and opens up the chapters of Noah’s Ark for questions. He fills it with snakes blood and brimstone, all of which give it a divine openness. It is, after all, one of the Bible’s most mythical chapters. The film is a heavenly feast of visuals as Aronofsky gives Noah’s story an effective dystopian-like setting. It’s a grey world, the kind of place one imagines while reading Margaret Atwood’s Oryx and Crake, and it sits somewhere between Middle Earth and Eden. Fantasy or steampunk, ancient or innovative, Noah exists in a visually stimulating purgatory. The visuals are especially striking in a series of interludes that mediate upon creation as montages and visual pizzazz effectively celebrate the wonders of creation while also marking Noah’s story as an allegorical one. Sumptuously coloured shots by Matthew Libatique and frenetic editing by Andrew Weisblum add moments of Malickian beauty and Black Swan madness as Noah offers imagery so evoke it’s bound to delight both the faithful and the faithless. The score by Clint Mansell, however, is the element of the film most akin to a religious experience as it graces the scope and overall craziness of Noah with enthralling notes. It might be the best score so far this year. Noah is equally striking for how tangibly it humanizes these Biblical characters. 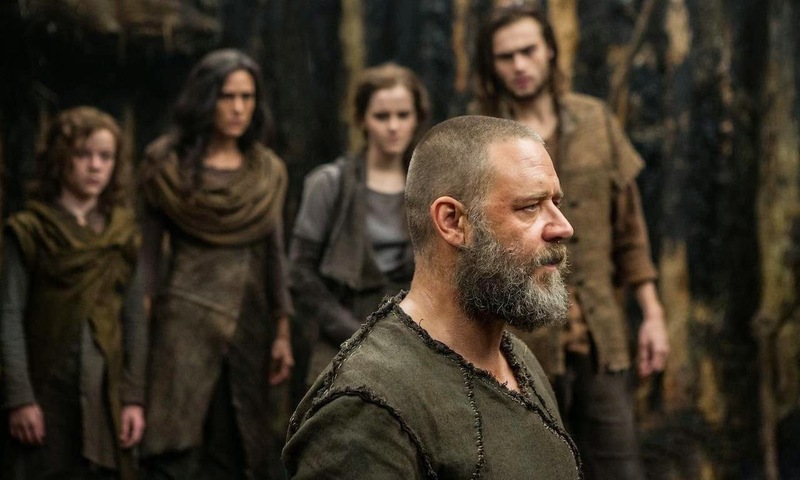 One might see it as sacrilege to bump Noah off his pedestal, but Aronofsky, Crowe, and company do an immaculate job in creating an epic saga of madness that explains what drives Noah to drink and, in turn, recycle the wretchedness the flood aims to cleanse. Saving the world from all this water leaves the family struggling for faith and meaning as they drown from the burden of being the few chosen survivors. Noah eschews easy answers and makes the film more relevant to an audience for which faith is on the decline. This adaptation acknowledges the innate fallibility of humankind and inadvertently suggests that any doctrine or faith precipitates a kind of exclusion. The consequences of Noah’s actions are most damning when he takes the words of his mission literally instead of balancing his divine mission with the reality of life aboard the Ark. Damn or be damned, Noah is fascinating stuff! Noah also happens to be a goddamn mess. Amidst the sweeping philosophical openness of the film sits a bloated action flick. Noah suffers from a bizarre schizophrenia of battle sequences, CGI monsters, and a villainous foe (Ray Winstone) that let Noah play the role of an action hero while he steers the Ark. All the action stuff, though, just seems like filler. It’s pointless; stupid even—almost laughably so as Noah battles bloodthirsty wannabe boaters with giant rock-laden angels. Noah, much like Maleficent or Oz: The Great and Powerful, takes a great idea and muddles it by pandering to the demands of premium screen entertainment. There is simply no need to turn the Bible into a video game when the scope of the film and the astonishing creation of the Ark by production designer Mark Friedberg give ample bang for big screen bucks. The ambitious and waterlogged Noah far exceeds the stupidity that punctuates much of its first hour, though, for it is a visually and philosophically superb feat. Only an artist could make something so Biblically bonkers and largely succeed. Noah, for all its faults, is far more entertaining than time spent at church, and it's likely to provoke far more thought. Noah is now available on home video.